This premium black T-Shirt is made from 100% pre-shrunk cotton for a long lasting fit, even after being washed several times. 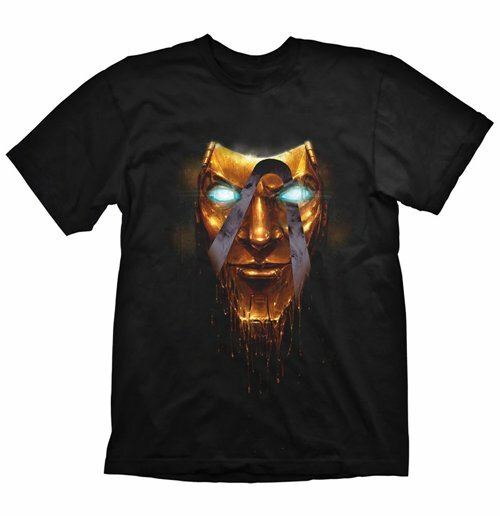 The main motif is a golden mask of 'Handsome Jack' with glowing eyes and his super handsome smile, who is the main antagonist from the Borderlands popular gaming series and self pro-claimed dictator of Pandora. All of the artwork is printed using a very durable silk screen procedure. Each T-Shirt is packaged in an eye-catching blister packaging for easy presentation on blister walls or shelves.